If you got in the car and drove into any town on any given day, it’s likely that you would pass by several banks. PNC, TD Bank, Wells Fargo, Bank of America—the list goes on. They are all over, and what we are used to seeing while on the road. But, if you live in Bucks, Lehigh, or Montgomery County, you’d likely see a sign with a little blue cupola topped with a weather vane and of three orange letters: QNB. QNB Bank is an independent local bank thriving among the big guys, and this past July, the bank celebrated its 140th year of banking in our area. Brian Schaffer, vice president of marketing for QNB Bank, says that the bank’s success can be attributed to several factors, one of which being the “stable leadership” they’ve had. In the entire 140 years of the bank’s history, there have only been seven presidents—that’s an average of 20 years per president, which is quite impressive. Aside from the strong leadership, QNB Bank serves a limited geography: there are only 11 offices in the company. Because of this, the bank is able to give more personalized attention to their customers and be sure they are doing their best to help any way they can. That honesty goes a long way for customers no matter how long they’ve been with QNB Bank. For younger people, it can be an overwhelming experience walking into a bank, whether it be to open their first checking account or to figure out a private student loan for college. With that in mind, there is great comfort in knowing that QNB employees care to take the time to figure out what option is best. Additionally, long-time QNB Bank customers always know they’re going to get the same attention and care they’ve always received. And if a customer moves out of the area—even a different state—they don’t need to change banks. While they won’t be able to step into a physical bank, customers have access to QNB Bank’s mobile app, which provides account information and allows the convenient option of mobile check deposit. Plus, additional help is just a phone call away. 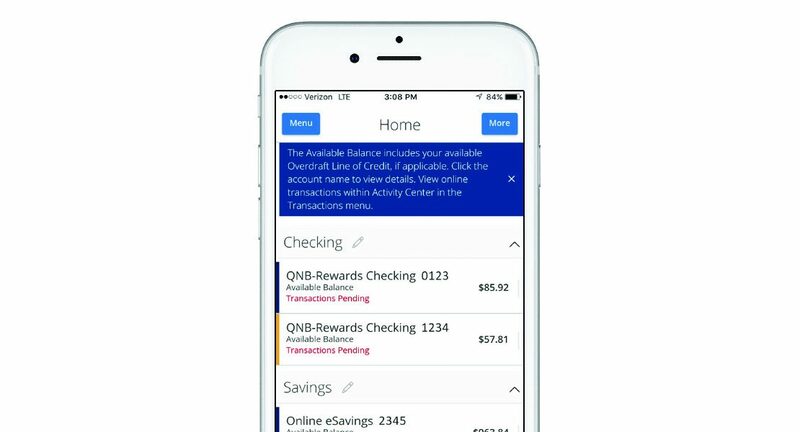 Brian says that this makes QNB Bank “high tech and high touch”—customers have access to the same technology that big institutions offer, but more personable service. Outside of the office, QNB Bank gives back to their community in big ways, and every year the support gets bigger. Last year alone, the bank did over 500 community support fulfillments within a 25-mile radius of Quakertown, and the support is climbing to about 600 this year. Three of the bigger, well-known causes the bank supports is Relay For Life, the American Diabetes Association, and March of Dimes. Every year, QNB Bank sponsors the March for Babies, a special 5K walk/run to raise awareness and support for babies born prematurely. QNB Bank is also on their seventh year of the “Batting for Books” organization with the IronPigs—for every double hit by an IronPigs player, the bank donates five dollars to a local library, with a different recipient each year. The 2017 recipient was Southern Lehigh Public Library, who received a whopping $5,700 from QNB Bank, a record-breaking donation for the bank. This past July, the bank celebrated its 140th year of banking in our area. So whether you’re a customer or shareholder of QNB Bank, or a part of the community who has received funding from their generous philanthropic actions, there’s no doubt that QNB deserves a big thank you. Happy 140th, QNB Bank, and here’s to another 140.